ROAD TOWN, Tortola, VI - The sparks flew bright and early Sunday morning May 15, 2016 at the St George’s Episcopal (Anglican) Church in Road Town when a war of words broke out between member of the congregation and controversial talk show host Donald E. de Castro and Rector of the church Dr. Ian E. Rock. However, de Castro’s efforts became amplified when he attempted to read out a prepared statement to the congregation this Sunday following the end of the announcements and notices. De Castro also alleged that the finances of the church are in disarray. “It has been brought to my attention that the church has some serious financial issues…” he said before his microphone went dead as a result of Dr Rock’s instructions to the person operating the PA system. Following the final word on the matter from Dr Rock there was a loud round of applause for the Barbadian man of the cloth. A male member of the congregation pursued de Castro outside and on catching up to him told him that his actions were inappropriate as it wasn't the time nor the place for such a statement. It is not the first time that de Castro has spoken out regarding issues in the same church. On his radio show of April 13, 2016, de Castro alleged that one member of the congregation allegedly referred to his brothers and sisters in Christ as “rats”. According to host of the radio talk show Straight Talk, Donald E. de Castro, this event has caused ripples in the already disturbed waters of the house of worship of which he is a member. On the radio show de Castro expressed disgust at the member of the congregation for referring to church members in such derogatory language, noting that at the time there were persons from other denominations in the congregation. “In one of the general meetings one of the church members got up and said 'we need to get the rats out of the church'. This was in January 2016. How could you be worshipping and greeting people with peace every Sunday and you going to call your brothers and sisters rats in a church meeting?” he asked on his radio show. “[There is a lot] of division in the St George's Episcopal Church since about October or November last year when we got a new Rector Dr Ian E. Rock,” he said. According to de Castro on the show, Dr Rock has ceased all fund-raising activities for the Church's schools, saying that this is child labour. “If that was child labour in the Public and Private schools the Government would have done something about it already,” de Castro had said. “Myself and another member of the congregation sent in our concerns in the form of a petition to the Vestry. A number of members of the congregation signed the petition and neither the Chairman of the Vestry nor the Junior or Senior Wardens saw it fit to put our concerns on the agenda,” he said. De Castro alleged that Dr Rock came to his office and threatened to sue him for defamation of character. He alleged too that Dr Rock fired a secretary in the Church who had worked there for almost 13 years. De Castro added that persons are inquiring as to the reason that Dr Rock was allegedly turned down for a position in a New York Episcopal Church. According to media reports out of Barbados, students of Codrington College where Dr Rock had been Principal, complained about the treatment that Dr Rock meted out to them, including denying of access to the college bus to attend classes at the University of the West Indies Cave Hill Campus and being fingerprinted by Police following an attempted break in. Why Donald don't rest himself? He want to fix every gas leak, but he is not qualified to fix the church's gas leak. He has so much gas in he tailpart that needs fixing. If it was a British white man, you wouldn't hear a thing. Ah, sah. Look what the churches come to. Why you have to bring white people into this? They are not a standard by which we should judge our own actions. Now, I kind of see what Donald is getting at, even though he used the wrong place and time for his statements. People like Donald always talking but no action what about the labor thing do any one see any progress yet no nothing because all he does it talk and no action instead of talking lets all see some action it have all kind of BIG NAME people on the CHURCH BOARD and they not doing nothing either all of a sudden the ANGLICAN CHURCH in all kind of thing is this a church of THE LIVING GOD OR A MARKET PLACE my SON tell that he like going there but of lately he doesn't want to go and he is a young man what does that tells you we need to get with the lords work and done with all this POLITICS belongs too those POLITICIAN them I am an ANGLICAN and I so heart broken about what happening in our church. That church belongs to the decastros and the rest of the down town hifalutin. But you leave out the part where the remaining congregation applauded loudly when Mr. DeCastro's mike was turned off. He ain't solving nothing so why listen to him. Come with a solution to the problems Donald then we will listen. Stop being used by the Devil. Why don,t those who are so distressed with this priest look for the background and the dirt of the priest who left? Guess he was able to brain wash them so they could not even see the wrong he was doing. The whole matter seems to need legal attention. Do not do that . Show some respect to both priests. Stop comparing Father Branche with Dr. Rocke. It will solve nothing. Obviously there are issues that the vestry needs to address urgently but they are not doing it. There is just too much discontent and we are turning a blind eye. A number of letters were sent to the vestry outlining concerns and the vestry has chosen to ignore those letters. Many persons are concerned with what is happening but they have chosen to just walk away from St. Georges. Donald have a right. If he requesting a meeting with the people and they ignoring him, then what other option does he have. The vestry of that church is a mess and think they better than anyone and don't want to listen to the people. Donald is right. In the Anglican Church, one of the two the high holy days is Pentecost, which used to be known as Whitsunday. Mr DeCastro claims to be an Anglican, but didn't know well enough to keep from politicizing on the Pentecost? He cares less about celebrating the Trinity together with his fellow congregation than keeping his own tongue wagging. This has nothing to do with the issues; it was necessary for Dr Rock to shut him down on the high Anglican Feast Day. It is his job as shepherd of his flock. Mr. deCastro have you lost all sence off normalcy. My prayer is that God will hold back his hand of judgement. And will reverse the curse you are creating for your offsprings as well as your extended family. May God have mercy on you. Leave Mr. Decastro alone. 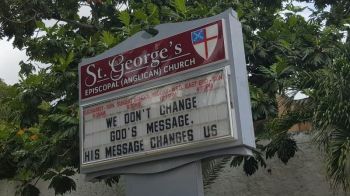 Many people are very unhappy with what is happening at St.Georges but they don't have the balls to stand up and say so. Thank the lord for Mr. Decastro. He speaks his mind and he does it in a respectable manner. Close to 40 persons have written to the vestry and the Bishop, months now about the way the church is being run and not even a letter of acknowledgement was sent to the persons. What kind of behaviour is this? 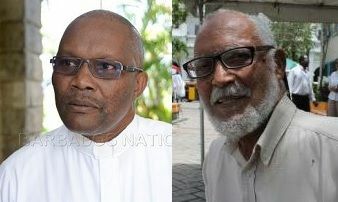 If they had called a meeting and discussed the issues, ST. Georges dirty laundry would never have reached the media. those 40 persons are the fools trying to divide the church and who have yet to read the church cannons which govern the church. the current rector is not doing anything wrong.